VATICAN CITY (CNS) — People need to open their hearts to the many people who are forced to migrate as they face enormous difficulties and sometimes tragedy, Pope Francis said. “I pray for closed hearts that they may open. 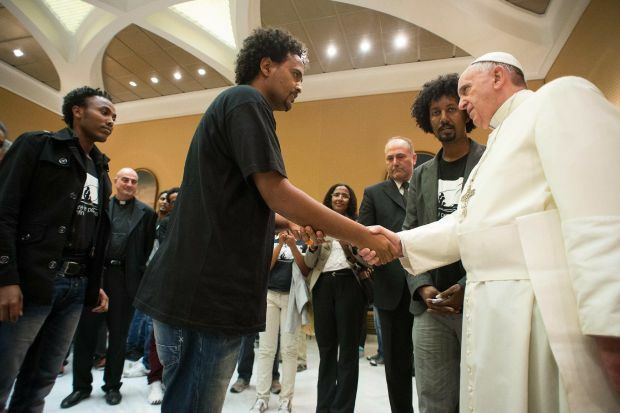 And everything I have available to me, is available to you,” he told a group of young Eritreans who survived a deadly shipwreck off the coast of the Italian island of Lampedusa. The pope met with 20 survivors and their family members at the Vatican Oct. 1, just a few days shy of the anniversary of the Oct. 3, 2013, disaster. More than 360 people were killed after a boat, reportedly carrying more than 500 migrants from northern Africa, capsized and sank near Lampedusa, Italy’s southernmost island. Some 155 people survived. Pope Francis sent a representative to the island a few days after the disaster to distribute aid and convey the pope’s prayers and concerns. The pope had visited the island in early July after seeing newspaper headlines in June describing the drowning of immigrants at sea. At the Oct. 1 gathering in a Vatican meeting hall, one of the survivors told the pope that many are still traumatized and many families don’t know where their dead loved ones have been buried after their bodies were recovered. “We don’t know where to go to cry for them, under what number” they’ve been listed as one of the many unidentified dead, said an unnamed relative of one of the victims. “We would like you to go back again to raise up your voice, so that no one is forced to flee their own country ever again, their home, their loved ones, so that no one is forced to risk their lives” to escape violence and poverty and search abroad for a normal life, said the relative, according to a written statement released by “October 3 Committee,” the group that organized the survivors’ visit to the pope. Pope Francis said he was speechless. “I don’t know what to say. I cannot express what I feel, because words are not enough to describe what you have suffered. This can only be contemplated in silence, with tears, and by trying to find a way to be close to you,” he said, according to Vatican Radio. “It’s most important that the doors to hearts are open in times like these,” he said, urging Europeans to open their hearts to those in need. The survivors gave the pope a wrought iron sculpture shaped like a bottle with a mother, father and child inside the bottle facing the opening. Marking the anniversary, Jesuit Refugee Service also called on the European Union to establish a system of humanitarian visas, assist with family reunification and increase its annual refugee resettlement quota. Despite Italy’s efforts, the U.N. refugee agency estimated 2,500 people died crossing the Mediterranean since January.